So this is the latest in my pilgrimages into the land of fabric painting. 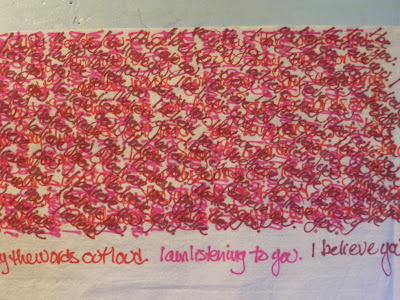 I was thinking about words again, after I wrote with gel glue a week or so ago, and this time I used different colors of permanent markers. I have a letter from my great, great, great, great uncle to his sister-in-law, (my g-g-g grandmother, Phebe), and when he ran out of space on the page, he just turned the paper 90 degrees and kept on writing. Well, it isn't all THAT legible, but I loved the design his wonderful thin writing made. Here I wrote three different sentences in three different colors, and in three different directions. And I think that I like it. Once I sew it into a doll costume and get it all embroidered or beaded, I think that the words will become a deep secret and all that will be left will be the color and the design.